Always suspected in having handled a machine gun in the 1929 massacre. Is owner of the Circus Cafe ruputed hangout for the Capone satellite gang. Capezio was almost sure as hell responsible in getting rid of the evidence following the massacre.He was torch cutting a massacre getaway car in a garage near the Circus Cafe when the gas canister in the engine exploded and burnt his hands and arms. October 3,1930 Capezio is captured with two others during a raid on the Greyhound Cafe situated at River road and Grand avenue. Capezio is seen by police flinging a .45 caliber automatic under a table.He is brought in the following day to the State's Attorney's office for questioning. October 9th He is charged with carrying a concealed weapon and held to the grand jury on $10,000 bonds. May 1931 Capezio is questioned and released concerning Mike "The Pike"Heitler's death.Heitler was the whoremonger whose body was torched in his car near Itasca,Illinois. June 25,1931 Capezio, Claude Maddox,Rocco De Grazia,Louis Stacey,John Purdy and Lawrence Imburgio are all arrested in a Du Page county roadhouse.All were drinking and gave fake names and addresses. Police seized them for questioning in connection with the 1929 massacre of the Moran gang. Tony favored crime is robbery ,banks, stores etc... On November 8,1931 Capezio is arrested for armed robbery along with his robbing buddies Frank Zanger and John Du Bois. Witnesses at the robbery where unable to identify any of the suspects, but Capezio was detained by Chief Shoemaker as requested by W.F. Watkins. Watkins was an aid to the Assitant secretary of labor and was at the lineup.He was implying that Capezio was born in Italy and was never naturalized.Capezio was questioned by the federal inspector. Asked to raise his right hand Capezio throws up both hands. THE INSPECTOR- Now, you're under oath.Where were you born? INSPECTOR- Don't get funny with me.You're talking to a federal agent.Now where were you born? CAPEZIO- Ohio, Pennsylvania.I dunno.Small town somewhere. The questioning was to resume the next day. November 9,1931 Police release him after a night in the slammer.Capezio leaves grumbling about bedbugs disturbing his sleep. Capezio appears the following week in front of immigration officials with a proper documentaion of his baptismal records in order to avoid deportation. January 9,1932 Tony Capezio and another Capone gangster named John De Bias alias John Banana surrendered at the Cragin police station and were held as suspects in connection with a robbery January 5th of that year of the James Building and Loan association situated at 5717 Fullerton avenue. Identified by two witnesses (A cashier and a policeman) both deny the charges. In August 1932 Tony's dad Joseph Capezio passes away. September 1,1932 Tony Capezio is arrested at Chicago and Ashland avenues by policeman Thomas Burke of the Racine avenue station for carrying a gun.During his stay at the police station, he is identified as one of the members of a gang who took $9,160 during a June 9th holdup at the State Bank of St.Charles. Two witnesses,Cashiers Vernon Olsen and Frank Burr made the identification. September 2,1932 Capezio is arraigned in St.Charles for the June 9 holdup.His bond is set at $25,000 which is immediately paid.He is released pending his trial. September 16,1932 Tough Tony is freed in Elgin on the charge of robbery in connection with the St.Charles holdup.The witnesses, who were very nervous, were not so sure it was Capezio after all.A wise choice indeed. September 30,1932 Capezio is freed by Judge Justin McCarthy on a charge of disorderly conduct. February 1934 Tony Capezio and Louis Campagna are arrested while riding in an automobile.They are sent to the detective bureau for questioning on three murders.Both do not talk. June 11,1934 Vagrancy charges are dropped agianst Campagna and Capezio. December 22,1935 a tavern called the Par Mar is raided for being open after closing hours.Capezio who is the real owner is arrested along with 28 others with police records there.A hot dice game was in progress upstairs.For his undying loyalty, Tony acquires profits from handbooks in Cook County. October 27,1936 Tony Capezio is arrested at Western and Chicago avenues by police.Capezio is identified at the bureau for a robbery of $1,000 against Stephen Alex restaurant owner (1150 Wabash). Capezio claims having nothing to do with it and that he part owns a florist shop at 2408 Chicago Avenue, where he also resides. November 16,1936 Capezio is picked up by police at his florist shop for armed robbery against John F. Cuneo (President of the Cuneo press) and his wife at 3300 Lake Shore drive.They were robbed of $25,000 in jewelry. Mrs.Cuneo was ill and in totally shock for days after the incident. Several hours after the robbery one of the bandits is shot and killed by his confreres for disputing the split of the booty.After the robbery Capezio is suspected in killing his bandit friend John Benedetto.His body is found in a car in front of 3450 North Racine. November 18,1936 During a lineup Mr. Cuneo is unable to identify Capezio as one of the robbers.He develops Chicago amenesia after learning who Capezio is.The Cuneos do manage to positively identify the dead body of John Benedetto as one their robbers. Go figure! February 4,1937 police are searching for Capezio after two gunmen invaded Ryerson Automobile at Division and Dearborn and make off with bracelets and a handbag.Owner Joseph T. Ryerson and Barrett Wendell also had their wallets taken in the robbery.Total taken $7,080. December 13,1952, 27 men are arrested in a raid at Grand Club Tavern.The club is owned by Capezio, but he is not there during this raid. April 17,1953 Tony Capezio leaves Oak Park hospital.He had been there for several weeks of treatment. July 7,1955 Capezio (1048 Ashland) dies from a massive heart attack on the golf course at White Pines country club. (Du Page county near Bensenville).He collapses at the fourth hole and his golf buddy places him on the electric cart and takes him to the clubhouse.The Bensenville firemen were called and they worked on him for 45 minutes with an inhalator before Dr. Paul Hasbrouck pronounces him dead.He had been suffering from a heart ailment for some time.He was 53 years old. Later erroneous reports claim Capezio is struck by lightning on the golf course. More than three hundred people attend his funeral on July 11,1955. 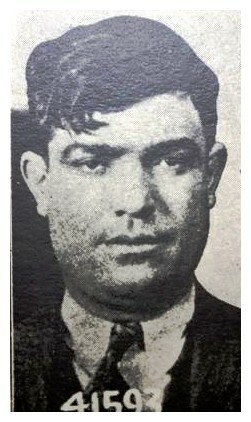 Most top mobsters shun the funeral, not because of any dislike towards Capezio who was a loyal man to the Capone mob. It is simply because most don't want to be seen by police or federal agents who mingle around the area.Claude Maddox, long time friend and cohort does show up.Mostly the wives of top mobsters attend, such as Clarice Accardo and others. Capezio leaves a wife a daughter.